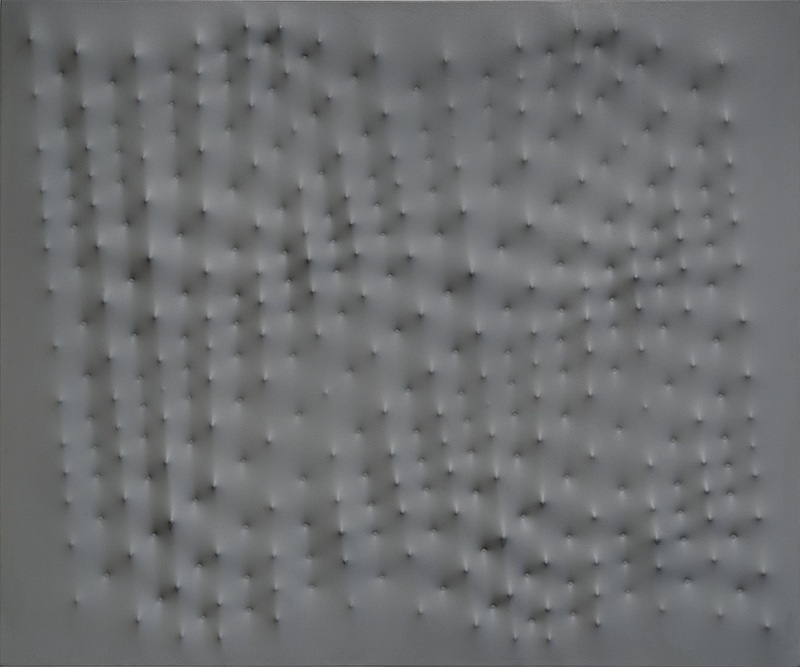 Born in Rovigo in 1930, Enrico Castellani studied art, sculpture and architecture in Belgium until 1956, when he graduated from the Ecole Nationale Superieure. The following year he returned to Italy, settling in Milan, where he became an active member of the new art scene. In particular he worked together with his friend Piero Manzoni, with whom he formed an artistic collaboration. The contrast between their personalities brought curiosity and interest from the art commentators of that time: as Manzoni was so volcanic, dishevelled and playful, whereas Castellani was serious, distinct and reflective. Inspired by action painting, especially by Mark Tobey, and recognizing this kind of art as a way to reach successful completion, he starts a new beginning, which suggested resetting the previous artistic experiences, and establishing it on a new friendly association with social progress. 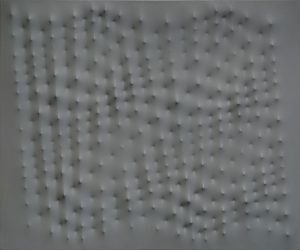 This reset is accomplished by Manzoni and Castellani Bonalumi with the use of monochrome canvases (often totally white) everted with various techniques to create effects of lights and shadows with the changing angle of the light source. It was a totally original and considered of fundamental importance in the history of abstract art of the twentieth century, not only with regard to the Italian scene, but especially the international one, the echo of which influenced and inspired by Donald Judd in an article Castellani in 1966 called the father of minimalism. 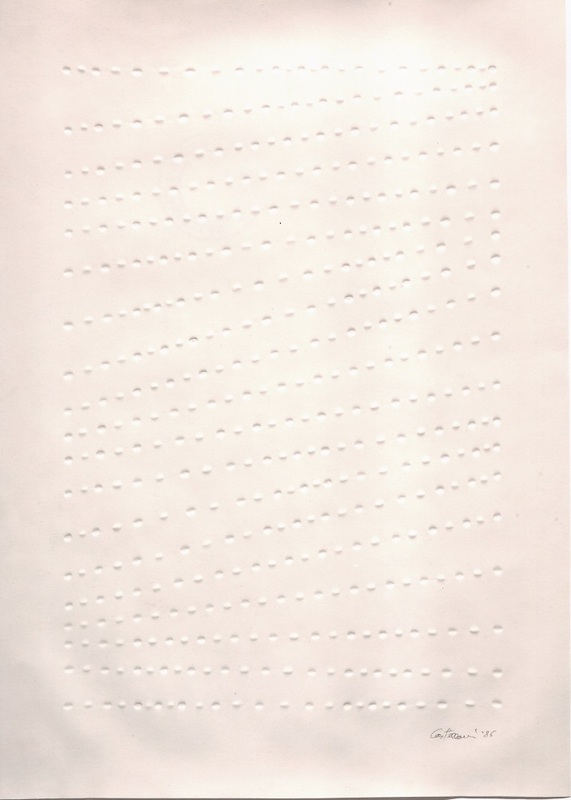 If Piero Manzoni chose as favorite materials as kaolin and cotton for its famous “Achromes,” Castellani and Agostino Bonalumi embarked on a rigorous course of study and analysis of the possibilities provided dall’estroflessione of the canvas through the use of nails, ribs and shapes of wood and metal inserted behind the canvas. Is in 1959 that Castellani made his first relief surface, creating a poetry that is his constant and rigorous stylistic and defining what the critics have called “different repetition”, considered by many critics of extreme purity, where the carefully chosen repetition of full and empty on the rhythmic protrusions of the canvas is always a new path, even if it is coherent and intense. Since then his progress continues to develop in dell’estroflessione, but in a compact and coherent production are some works that deviate significantly from the surface in relief, revealing a lot about issues dear to Castellani such as tempo, rhythm and space . In 1967 he produced “white environment” for the “image space” at the Palazzo Trinci, Foligno, in 1968, on the occasion of “The scene of exhibitions,” The Turtle Gallery in Rome, presents “The Wall time “and in 1969 he produced” sheet “and 1970” Obelisk “. From its inception until today follow a number of important exhibitions in public and private spaces. Join the Venice Biennale in 1964, 1966 (with a solo) in 1984 and 2003. In 1965 participates in the collective “Resonsive The Eye” at the MoMA in New York and the Eighth Biennial of Sao Paulo, Brazil. In 1970 he took part in the collective “Vitality of the negative in Italian”, curated by Achille Bonito Oliva, the Exhibition Palace in Rome. In 1981 he participated in “Identité Italien. Article en Italie depuis 1959”, curated by Germano Celant, the Centre Pompidou in Paris.In 1983 at the Palazzo Reale in Milan for the exhibition “Art and kinetic Program 1953-63”, in 1994 he was invited to the exhibition “The Italian metamorhosis” at the Solomon R. Guggenheim Museum in New York. He died December 1st, 2017.